'Variety' as the saying goes, in this case the world of modelling Shays, logging and similar 'backwoods' activities. A clever well executed compact layout in HO just 5ft x 11in including a traverser served fiddle yard, of a US rural shortline terminal. Details of an A3 Challenge Winner; this being a French shunting layout with further possibilities. This also an A3 Challenge Winner, and of the end of a small N gauge American branch lakeside terminal. A technical article on their form and construction, and how to model them. Another technical article on these, with suggestions how to model them realistically. Built at the size of 2 x A4 this entry was of a HOe narrow gauge railway at its terminal and capable of enlargement, set in the Channel Islands. 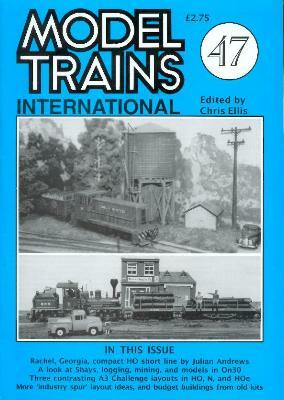 Information on these archetypal backwoods locos as now provided by Bachmann in G, HO and On30, other types of motive power and logging railways. Shays, Speeders, jimmies, cars and other curiousities of logging railways mainly in On30 but equally applicable to others, by conversion and adaption of existing models to narrow gauge. Further developments of the shunting or switching layouts referred to in 45 and 46 of between 4ft and 6ft long by about 6in wide. Adapting and converting buildings from the Airfix or Dapol range, showing a British rural station and a German signal box.